On Saturday we visited a "Cat Cafe" in downtown Tokyo. A Cat Cafe is a place where you go in, have a cup of coffee and pet the many cats who are wondering around the room. Not as much fun as you would think. I kind of felt sorry for the cats and they, in turn, were not very interested in me or Yumiko or any of the customers. 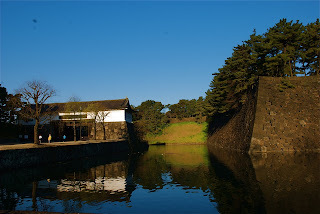 Today we took the subway to Hanzomen to take some photos at the main gate of the Imperial Palace. 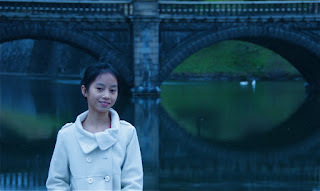 Here is a picture of Yumiko just in front of the bridge to the palace. Tomorrow Yumiko leaves for a five day ski trip with her 7th grade class. We are keeping our fingers crossed that all will go well. 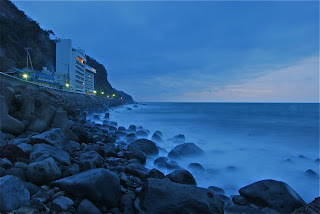 Ken and I also leave tomorrow for a few days in a hot spring hotel (onsen) in the town of Atagawa on the Izu Penninsula. Can't get over how much I love these hot springs. Who would believe!! Anyway, we'll be back on Thursday. In the meantime - have fun. It rained all night last night and most of the day today. 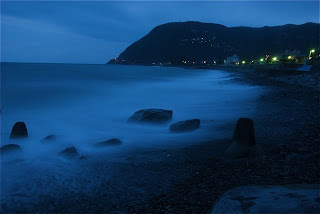 I learned that a great time to take photographs is in the rain. Everything is more vibrant and colorful. So, after breakfast, I put on my raincoat, tucked my camera in its bag, grabbed my tripod and umbrella and Yumiko and I trudged off in the rain to her school. I again veered off into Arisugowa Park and took a new higher path. 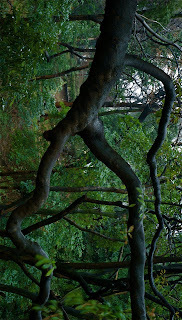 There I found this wonderful branch that looked to me like a tall, skinny, naked, long legged running tree. Take a look. Had fun today with the start of a new week's photo assignment. This week it's all about composition. 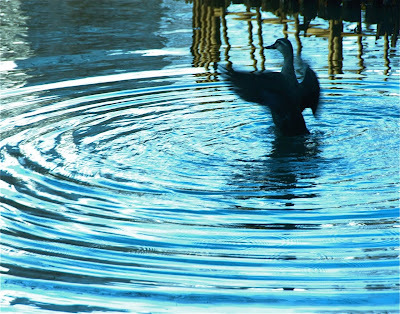 I started by taking photos of a duck in a pond at Arisugawa. 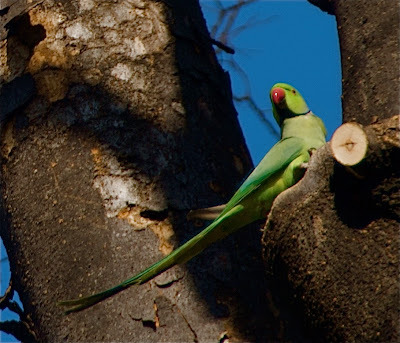 While I was photographing the duck standing up and flapping his wings, I noticed two large green parrots flying high in the tree tops. I couldn't believe it, but there they were. Ken said there is no way there were parrots in Arisugawa Park or anywhere in Tokyo, unless they were escapees from somebody's home zoo. But take a look. 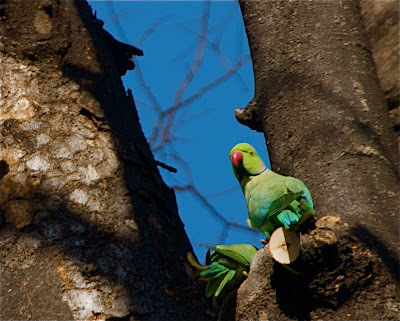 These are parrots I am sure. And they don't look like escapees to me. They look like they are right at home in Arisugawa Park. Today Ken and I went back to the father and son dentist team to have a second day of cleaning. I am so hoping that the custom in Japan is to have a two day cleaning appointment. The first day is for the bottom teeth and the second for the top. Either that, or Ken and I both really needed to have our teeth cleaned and they couldn't do it all in one day. Again, I had the father dentist who didn't say a word. But I did notice that he had very expressive and bushy eyebrows. I watched them go up and down and bunch together as he was cleaning my upper teeth. They very much looked like he disapproved of how much plaque there was to remove. But other than his eyebrows, he was very quiet. Ken, on the other hand, had the son dentist with long, rather oily hair. He never stopped talking. This time Ken said he talked about everything including just how he should brush his teeth and do a better job of flossing. Ken was not thrilled but took it all in stride. Oh, I am so glad I had the father. 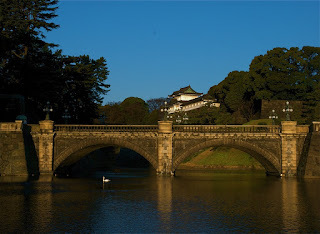 On the photo front, I again walked with Yumiko to her school and scooted over to Arisugowa Park. 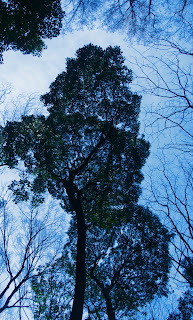 As I was walking I looked up at a tall beautiful tree and at the very top it had a large branch that was growing horizontally rather than vertically. I took a picture of it and then rotated the picture in my computer so it looks like a fully formed tree standing straight up. I think it is kind of a neat effect. Check it out. What do you think? Today, after breakfast, I walked with Yumiko to school and then veered off into Arisugowa Park. Arisugowa is a beautiful park filled with streams and paths and steps and waterfalls and beautiful trees. I go there a lot. Today I met my friend Joe - a woman from Taiwan who feeds the stray cats and crows and birds. She is great lady with a heart of gold. She was pinning oranges into the trees for the birds and they were gathering all around her as they know she is their best friend. I took some pictures of the tree tops with my new wide angle lens. I'll post a photo here for your viewing pleasure. This afternoon Ken and I took a $40 taxi ride to the other side of Tokyo for an appointment with an acupuncturist. Ken said it was a good visit and he actually felt a lot better afterwards - less pressure in his head and his arms and legs didn't feel so stiff. We then took the subway back home through Shibuya station - a lot cheaper than the taxi. It's now about 8:30. We had a marvelous salmon dinner cooked by yours truly and then all three of us took a wonderful bath in the deep ofuro in our apartment (separately - don't get any ideas!) Another day - come and gone. Just before dinner I saw the clouds in the sky again just looking so wonderfully interesting. Here's what they looked like. It has been quite a weekend. Yesterday - Valentine's Day - was Yumiko's ballet performance at U-Port theatre in downtown Tokyo. We were worried that she might be too sick to perform. She's never ever sick, but two days ago, she woke up sick as a dog with a fever, cough, headache and pale as a ghost. We went to the doctor's office and he prescribed some antibiotics and lo and behold, she rallied. Her performance was magical. She is just a wonderful little ballerina. I wanted to take photos of the performance, but it was strictly prohibited. So..... 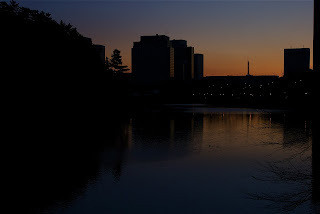 I am including a few "light" photos from early this morning and later this afternoon. 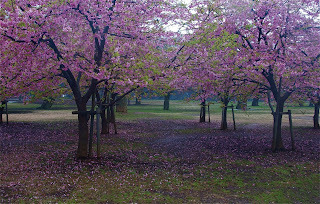 This includes an egrit and a few crows from Yoyogi Park, magnolia blooming on Omotosando, and some early cherry blossoms against the sky in Aoyama Cemetery. We can feel Spring in the air. Hallelujah!! We had a busy day today. 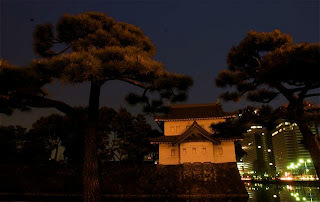 I woke up early and took the 5:18 a.m. subway to the Imperial Palace to try and find great light for dawn photographs. I got a few - nothing earth shattering. Came home by 7:30. Yumiko was a little sick with fever and cough and stomach ache. Not good as she has her big ballet recital tomorrow. After breakfast Ken and I went to a father and son dentist and sat side by side in the dentist's office. I had the father dentist who was very good and didn't force me to say a word. Ken had the son dentist who never stopped talking the whole time. I laughed and laughed to myself hearing Ken trying to respond to his dentist with all that equipment in his mouth. After the dentist, we took Yumiko to see a doctor and he diagnosed that she has a little virus that has to run its course. Hopefully she will feel better tomorrow. This morning I took the train from Omotesando Station to Nezu with Ken's brother Tokuya San. It was rush hour - about 8:00 and the train was packed solid. 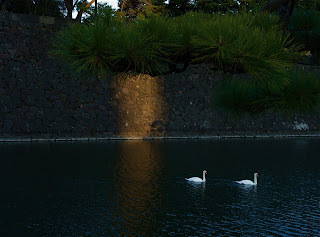 Tokuya, knowing that I wanted to find new places to photograph, introduced me to his friend Kimiko Takahasi. Takahasi San is a wonderfully warm kind person who has lived in Nezu for the last few years. She took me to beautiful places throughout Nezu and Oeno. 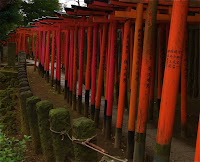 We visited the campus of Tokyo University, and then visited many shrines and beautiful gardens. The cherry blossoms are just about to bloom, some have even begun. This is a neighborhood I will most definitely return to. It reminded me of the narrow streets of Boston. Here are a few photos from today. 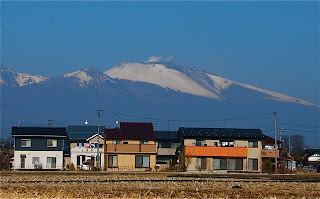 Last Thursday Ken and I got up early and took the bullet train to Sakudaira near Nagano in Central Japan. When we walked out of the train station, right there in front of us was Mt. Asama, the same volcanic mountain that erupted last week spewing volcanic ash and molten rock high into the air. We took a taxi and I got a photo of the Mountain top as it sits behind the little town. Ken has mostly only good things to say about Japan and its culture, and I would agree. However after yesterday's little incident at the bank, he may have changed his tune just a bit. Let me give you the background which began a few weeks ago. Yumiko, as she did in the U.S., has saved every penny of her allowance since we've been here. (She is a clone of Ken in the savings department.) Although her savings is not a whole lot, Ken thought it important that she open a Japanese savings account. So, a few weeks ago he and I went to the bank to open the account. Many of you know that Ken has Parkinson's Disease as well as a bad case of Achilles Tendinitis, so walking is a struggle for him, especially in the cold, damp Tokyo weather. But we walked to the bank - which takes a good 20 minutes each way. We thought we had brought all of the necessary documents to open the account - Yumiko's passport, her health care card, photo I.D., Ken's passport, etc. We got to the bank and filled out all the forms, but at the end of this process the bank teller told us we needed to bring Yumiko's student I.D. card. She said we could take the forms home and have Yumiko sign them and then bring the signed forms back with Yumiko's student I.D. Ken was a bit upset at the time, but rules are rules, so we relented and took the long walk back home without the savings account. When Yumiko got home from school that day we asked her to give us her student I.D. card. At this time we also realized we needed Yumiko's I.D. to get a multiple entry visa to be able to travel outside of Japan while we are here. The next day we went to the Immigration Office with Yumiko's student I.D. and after filling out a lot more forms, we got her multiple entry visa. That night when we got home, I, for some reason put Yumiko's student I.D. on her pillow to return it to her (forgetting that we would need it for the saving's account.) The next morning Ken asked Yumiko for her student I.D. and she said she didn't have it. I said I put it on her pillow, but she said she never saw it. Ken then began to turn a little blue in the face, so I went through Yumiko's room with a fine tooth comb, but found no student I.D. At breakfast we were all in the foulest of moods. If I couldn't find the student I.D., then I would have to call the school and have them issue another one. The school already thinks I am a bit of a ditz, so I didn't want to have to confirm that, but Ken was not happy. So, after turning Yumiko's room upside down one more time without the student I.D., I called the school. The lady in the office was kind and non-judgemental when I told her I was the one who lost the I.D. She made Yumiko another I.D. and a few days later, Yumiko brought it home. The next morning, Ken got out the paperwork to have Yumiko sign the forms for her saving's account and there in the envelope was Yumiko's original student I.D. NO ONE, including Ken knows how the original student I.D. found its way back into the envelope, but all were forgiven. Ken then had Yumiko sign the forms for the bank using Japanese characters for her name. Later that day, we were on the road again walking back to the bank. 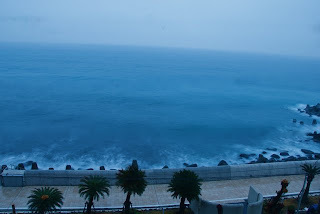 It was another cold, rainy day and it was very late. The bank closes at 3:00 p.m. and we got there at 2:45. The "Helper" in the bank said there were a few people ahead of us, so we would have to wait. At 3:05, our turn came up, but we could tell that the bank teller wanted to go home and wished that she did not have to wait on us. 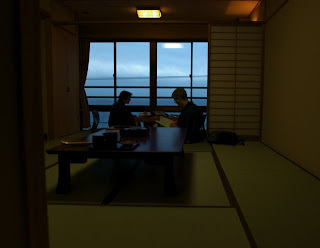 But we pulled out all the documents - passports, medical cards, student I.D., and the forms signed in Japanese. The teller looked over all the cards and documents and the form, then looked at Yumiko's passport and said in very polite Japanese, "Sorry, your daughter signed her name in her passport in English characters and she signed her name on the saving's account form in Japanese characters. That is not allowed. You will have to go home with a new form and have her sign it in English characters to match her passport." Well, if I thought Ken's face was blue when the student I.D. was missing at breakfast, it was now purple. I put my hand on Ken's knee and said, "Don't get stressed out." But, Ken had had enough. He told the teller that he wanted to see the manager. And wanted to see the manager NOW!!! The teller who was overly polite, got up and walked over to the manager. At this point, it is now about 3:20 and all the people in the bank want us to go home so they can go home. The manager came over and politely told Ken that rules are rules. But I think he too could see that Ken was not happy and that we were not going home without the savings account. So he relented. He did say that Ken would have to again fill out all the paperwork again and then sign his name and Yumiko's name using English characters. It is now 3:35 and everyone in the bank is still waiting for us to go home. Ken finally finishes filling out the new form. He then tells the bank teller what he thinks of the Japanese banking system. She smiles in a polite way and hands Ken Yumiko's new saving's account passbook. Then we get up from the far corner of the bank and make our way to the front door. Every single bank employee is standing up at their desks watching as we go. They all bow and say in one voice "Arigato Goziamus." At the front door (which has already been locked) the bank manager comes to say good bye one more time. Ken tells the bank manager to please just dismiss his complaint as that of one from a cranky old man, but, he insisted, the Japanese banking system needs to loosen up. Although I don't understand Japanese, I completely agreed. The bank manager slowly and politely nodded his head and we ambled out into the cold rain, clutching Yumiko's new saving's account passbook. Last weekend Yumiko posed for a few backlighting photographs on the windowsill in our hotel room at the Maza Prince Hotel in Northern Japan. She is a true sport. Yesterday I walked to the Meiji Shrine to see if I could get a good photograph of one of the interior hallways within the shrine itself. 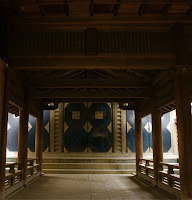 My photo school assignment this week is "Window Light" and I remembered seeing good "window light" at the Meiji Shrine. I took my camera and my tripod and ventured forth. Now I must tell you a few months ago I had gone to the Meiji Shrine with my tripod and a policeman had stopped me and told me that I could not use my tripod. I could take photographs, but use of the tripod was not allowed under any circumstances. I thought at the time he told me this because I had the tripod set up and was taking pictures of HIM. And I thought he didn't like having his picture taken and that made him a little cranky, so he told me no tripod. Since then, I have been very careful to keep the tripod laid low, especially when I encounter the Meiji Shrine police. So anyway, while I found good window light yesterday at the Meiji Shrine hallway, there was another policeman there who looked me over rather suspiciously and I decided it was not a good time to take out the tripod. So I didn't get the shot. 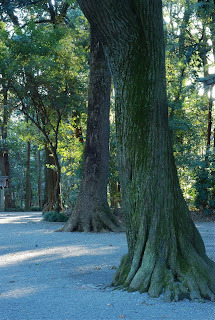 But after leaving the Shrine, but still in the Shrine park, I came upon two tall beautiful trees whose trunks looked as if they were giants walking. I set up the tripod and took their picture. When I got home, I looked at the picture and wished I had created a little more space around the trunk of the first tree. (See photo) I got up early this morning and was determined to go back to the Meiji Shrine - not for window light - but to take a better shot of the giants walking. By the time I got to the trees, the light was not good and I did not get the shot. So I walked out of the Meiji Shrine Park and ran right smack dab into the same cranky policeman who had told me a while back not to take my tripod into the Shrine Park. Seeing my tripod, he gave me the once over. But I don't think he remembered me. However, he once again said, "No tripod!" Oh boy.... I was never good at following all the rules.